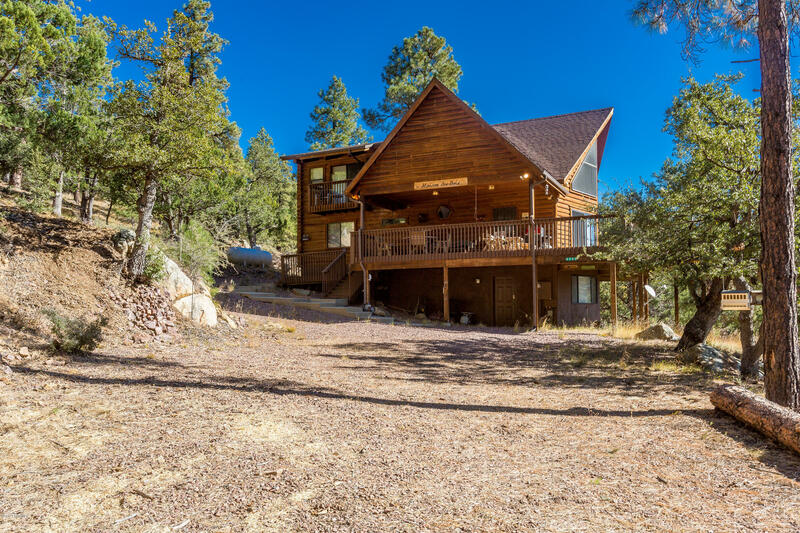 Over 6 acres of split-able land & this lovely log cabin in the pines! Wonderful private estate that backs to national forest on 2 sides. The home boasts two master bedrooms w/cedar walk ins, one on the ground level with outside entrance & the other on the top level with its own balcony. The 3rd bedroom is on the main level. Three full baths, one with a steam room, the other with a jetted bath & the main level has an lovely claw footed tub! Vaulted ceilings bring in light & amazing forest views. Private dining room with 3 walls of windows & a door to the large deck with 360 views of the forest and hills beyond. Private well with 2500 gal. storage tank, gated drive, fenced dog run, and room for horses. Recently stained exterior, major road grading, new tankless water heater & appliances too!